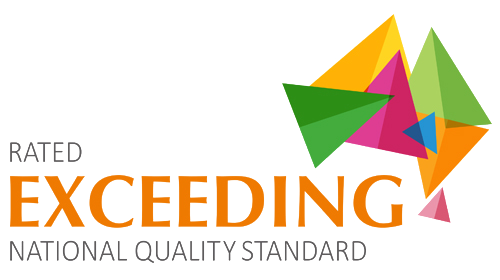 Glen Dhu has been Rated "Exceeding National Quality Standard"
The Centre is run by the Owner/Director – Mel Reid, who Approved Provider. The centre was established in 1993 & operated as the Glen Dhu Play Centre providing a Play Centre & Playgroup program for children 3-5 yrs. In 2001, the centre was purchased by Mel Reid who continued to operate the centre under a Play Centre Format. In February 2002 the centre was re named “The Glendhu Child Care Centre” with the purpose of providing full time care for children 2-7 yrs. In January 2008 we expanded our centre to include a new room to cater for children under 12 months old a new name change saw the centre being called Glen Dhu Children’s Services so we now cater from 6 months – 12 years. In January 2012 we had our last expansion! - we swapped our rooms around & Little Cubs now cater from birth to 20 months of age, Little Marines had walls moved around & then now cater for 20months - 3 years & are licensed for 15 chn. We also had a total revamp of our outdoor environments & we now have a lovely natural sustainable learning environment for us to all enjoy equipped with an outdoor classroom under a bamboo gazebo, an art studio enclosed in a new veranda, a super vegetable garden for us to nurture & a sensory obstacle course & a quiet fairy & gnome garden for us to explore in.